Senior National League of Democracy official Tin Oo (L) looks on as NLD leader Aung San Suu Kyi delivers a speech at party headquarters in Yangon, Nov. 9, 2015. Tin Oo, 88, co-founder of the National League for Democracy (NLD), spent almost seven years in prison and under house arrest under the military junta that ran the country before 2011, when military rule was replaced by a quasi-civilian government. In an interview with reporter Nay Rein Kyaw of RFA’s Myanmar Service, the retired general, former commander in chief of Myanmar's armed forces and trusted patron of NLD leader Aung San Suu Kyi discusses the NLD's effort to form a government after their landslide victory in Nov. 8 general elections. RFA: What is your opinion of Aung San Suu Kyi’s meeting with the president and military chief? Tin Oo: It is something we have to welcome. It is good that they said they will transfer the nation’s power peacefully and will collaborate with her in the future, but we have to wait and see whether they work as they said or not. We haven’t heard anything about power transferring yet. RFA: People have two concerns: 1. They didn’t discuss how to solve problems in the country. 2. They didn’t state a time frame for the power transfer. What do you think of these issues? Tin Oo: Yes, we have the same concern. They only said they agreed to collaborate and they are pleased for the meeting. That’s why I told you we have to wait and see. If they could discuss how to work together on solving the country’s problems, people will be very delighted. RFA: What is your understanding for time frame of the power transfer process according to constitution? Tin Oo: They have said they will transfer it within 90 days. It would be good to transfer the power as soon as possible. People voted willingly and they want to see the implementation of the election result that their votes produced. Actually, parliament shouldn’t be halted in the time between the two (outgoing and incoming) governments. RFA: Do you think the NLD is ready to form a government? Tin Oo: Aung San Suu Kyi and her group have plans, but they haven’t spoken out about it yet. 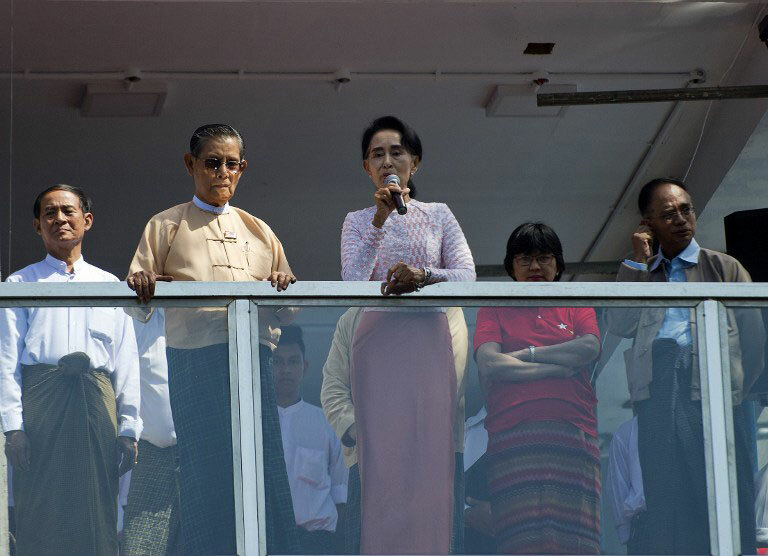 RFA: How will the NLD choose a vice-president and president? Tin Oo: They will be chosen by the party central executive committee. RFA: Will there be current ministers in the new NLD government? Tin Oo: I heard that there will be ethnic leaders as ministers and some suitable current ministers will be chosen. According to the process of national reconciliation, people from different organizations might be chosen as ministers as well, but no detail is announced yet. Translated by Khet Mar for RFA's Myanmar Service.